3 pieces of pork rind about 24cm x 12cm each. These Mexican pork scratchings are delicious. But they come with a health warning: always eat chicharrones responsibly. They are after all 100% fat. Nevertheless, the tall stacks of chicharrones occupying supermarket shelves throughout Mexico are a testament to the popularity of this snack. Mexicans eat them on their own or in avocado salads, with beans, sauces, ground into corn meal canapes, or as a topping for soups and guacamole (here’s Dad’s recipe for an authentic Guacamole). My version is a blend of two different techniques: Chinese and Mexican. I reckon that the Chinese know a thing or two about pork skin: for crispy pork belly they first blanch the rind in boiling water and then air dry it before cooking. A Mexican butcher airs the rind and then cooks twice in hot lard. Go to your butchers and ask for some pork rind. When buying rind from the back of the animal there is little fat. When cut from the shoulder there is more and when obtained from the belly there will be a considerable layer of fat. The layer of soft fat will vary and may have meat attached. This can be left on or cut back – depending on your preference. Boil the rind: Place in well salted water and simmer for 5 minutes. Dry the rind: Put the rind skin side up on a wire rack on an oven tray in the bottom of an oven at the lowest setting and let it dry for 4-6 hours or more (make sure this is drying not cooking). Put the rind skin side down on a chopping board. Cut a criss-cross pattern into the soft fat right down to the skin. Next cut the fat into small strips. Using a stout sharp cook’s knife cut through the rind to make strips about 2cm wide. Then cut across strips to make lengths of about 5cm – 6cm. 1st stage deep frying: Put the lard in a large deep pan and add vegetable oil to fill the pan half way. Heat the oil to 100C and cook the rinds for 2 hours, ensuring the temperature does not rise. Take out the rinds (turn off the heat) drain and cool. 2nd stage deep frying: Cook rinds a few at a time in the oil and lard brought up to a temperature of 185C – 190C. (A thermometer is essential here). Do not heat above 190C as you will be deteriorating the oil as it nears its smoke point. Mexicans use lard which has a smoke point of around 192C, so in theory more heat is not necessary. 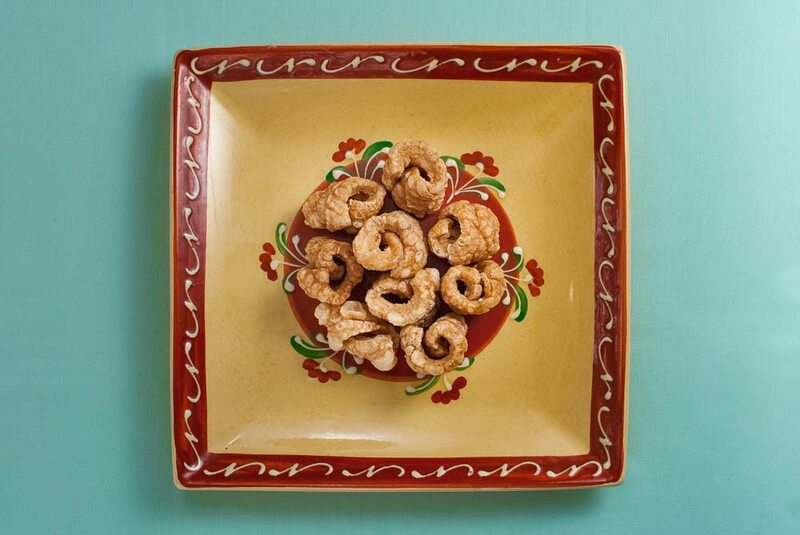 Using my method, all my chicharrones were perfectly light and crisp. A huge success. They will keep for up to a couple of weeks in an airtight-container.